Moorpark was incorporated in July 1983, 12.44 square miles. In 1887, Robert W. Poindexter was granted title to the present site of Moorpark. He named the City after the Moorpark apricot which grew throughout the valley. 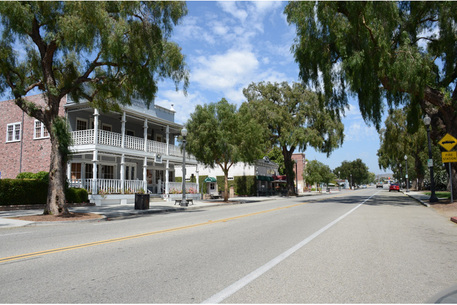 Poindexter plotted Moorpark city streets and planted Pepper trees in the downtown area. Conveniently located in the southeastern part of Ventura County just 50 miles northwest of downtown Los Angeles. Moorpark is recognized for having the lowest number of serious crimes committed in Ventura County and is one of the safest cities of its size in the United States! The Moorpark Unified School District encompasses 6 elementary schools, 2 middle schools, 1 high school, 1 continuation school and the high school at Moorpark College. Moorpark is well known for its quality education. The Academic Decathlon Team received the National Championship Title in 1999, 2003, 2008, and 2009. Moorpark College provides an accredited two-year program in business, science, performing arts, and vocational studies. Unique to Moorpark College is the Exotic Animal Training and Management curriculum. Students in this program operate an expanding on-campus zoo facility which is open to the public. The physics and astronomy departments also boast Ventura County´s only public observatory. Nearby universities within an easy commute from Moorpark include California Lutheran University, California State University at Northridge and California State University at Channel Islands.